A series of xLiMn1.4Ni0.4Cr0.2O4. (1 − x) Li1.2Mn0.54Ni0.13Co0.13O2, where x = 0, 0.25, 0.5, 0.75, and 1, were synthesized by solid-state method. The cathode composites included x values of 0.25, 0.5, and 0.75 showed both spinel and layered structures. When the amount of spinel component increased in the cathode composite, specific capacity decreased while rate performance and cyclic stability enhanced. Among the prepared composites, 0.5LiMn1.4Ni0.4Cr0.2O4. 0.5Li1.2Mn0.54Ni0.13Co0.13O2 (LL″S-0.5) delivered a good combination of high capacity, excellent rate performance, and high cycle stability, even after 300 cycles. It represented discharge capacities of 251 mAh g−1 at 0.1 C and 152 mAh g−1 even at 10 C. Furthermore, it showed high capacity retention of 94.4% after 300 cycles at 0.1 C. Additionally, ex situ X-ray diffraction results demonstrated that the both layered and spinel structures remained stable during the cycling of this cathode composite. 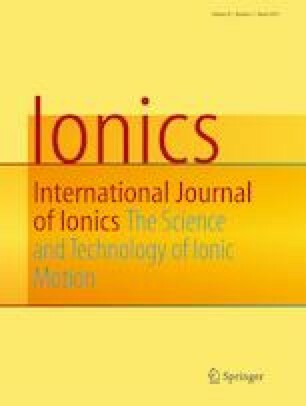 This study represented a novel integrated layered-layered-spinel cathode composite including chromium ions with high cycling performance as well as excellent rate performance can be used in advanced lithium ion batteries. The authors are grateful to Amirkabir University of Technology (Tehran, Iran) and Renewable Energy Research Center (RERC) for the technical support of this work.